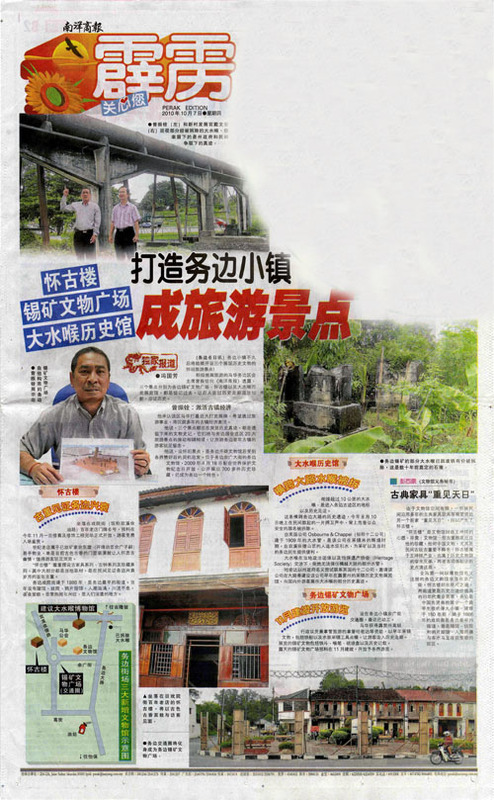 On Thursday 7 October 2010, Nanyang Siang Pau dedicated almost its complete front page of the Perak Edition to an article (shown above) with the headline “Making Gopeng a Tourist Attraction” . The story is great for Gopeng and heritage if it all comes to fruition. The plan is to provide three new museums/galleries/displays to add to the already very successful Gopeng Museum. This will really will make Gopeng a tourist town with plenty to see. First of all it is proposed to provide a museum dedicated to the story of the famous Gopeng pipeline, possibly using whatever has been salvaged after it was dismantled earlier this year. This proposal from YB Dato’ Hamidah Osman, Perak State Exco suggests the involvement of Osborne and Chappel UK. On the map, bottom left, this is the top building marked in brown. Secondly an antique shophouse, Huai Gu Lou, pictured just to the right of the map in the article and shown to the extreme left on the map, is to be turned into an antique display. Entrance will be free of charge. Finally YB Dato’ Hamidah Osman, Perak State Exco, in conjunction with MCA are turning the square roundabout opposite the heritage row and close to the existing museum (see bottom picture) into an open air tin mining display. This will open in November and is also shown on the map. In addition, the map shows (in light brown), the existing museum and the MCA office. The above is only a summary of the article which is quite detailed. I would suggest you get a copy from the local Nanyang office if you wish to study it in full. Together with the fine new Kampar Gravel Pump Mining Museum that will open next year, these two towns could well form a tourism centre that becomes a main focus of visitors to the State. Add to these Gua Tempurung, Nomad Adventure Sdn Bhd, the Gopeng Rainforest Resort, My Gopeng Resort, the established homestays in the area, all supported by the new train service stopping at Kampar, its Express Bus terminal and spanking new Grand Kampar Hotel, plus highway access to Gopeng this is a great step forward for the area. Congratulations to Dato’ Hamidah, the people of Gopeng and MCA. We wish you luck. This will certainly put Ipoh, our deteriorating State capital, in the shade as far as tourism is concerned and underpin the Lonely Planet’s appalling view of Ipoh.